We’ve sold Rory Conner’s outstanding cheese knives for years. 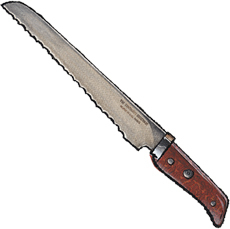 We've also worked to create an exclusive bread knife just for Zingerman’s. Rory makes his knives by hand in County Cork, Ireland. Without exception they’re handsome, super-sturdy, gift-worthy specimens. Rory’s knives are built to last a lifetime. It’s an heirloom-quality piece that a bread lover will cherish. The handle is highly polished laminate, coated in resin, colored a beautiful fall-leaf blend of brown and red. It’s held in place with stainless steel bolting. The slope nosed blade measures eleven inches, long enough to be useful when you’re working on a three pound Farm Round. The knife is packed in its own box, making it a nice candidate for a bread lover's gift.